Description: The flowers are in terminal, flat-topped umbels. 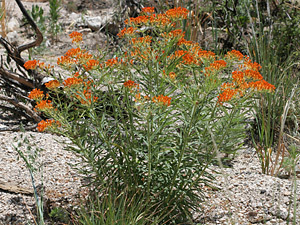 Each flower is solidly colored orange or yellow with 5 reflexed petals and an erect hood extending beyond the central column. The leaves are green and narrowly lanceolate. The stems ooze milky juice if broken. Butterfly Plant – The flowers attract butterflies, and it is one of the food plants for Queen (Danaus gilippus) butterfly caterpillars. 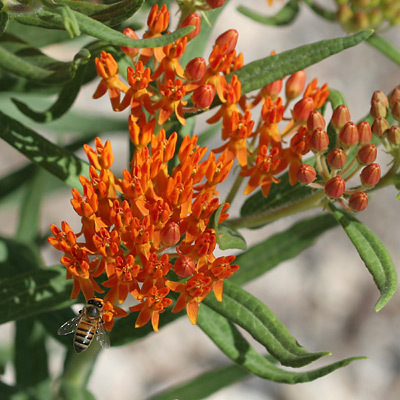 This attractive plant is a good choice for butterfly and wildflower gardens, and although Butterfly Milkweed does not transplant well, the seeds are widely available. It prefers full sun, well-drained soil, and supplemental water in hot weather. 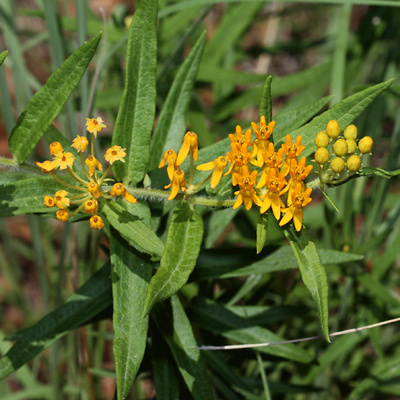 Culturally Significant Plant – Native Americans have traditionally used these plants for medicinal purposes, and the young shoots, green fruit, flower buds, and roots were boiled and eaten. Although this plant is poisonous, proper preparation reduces its toxicity. Poisonous – This plant is mildly poisonous, but it is only harmful if eaten in large amounts.